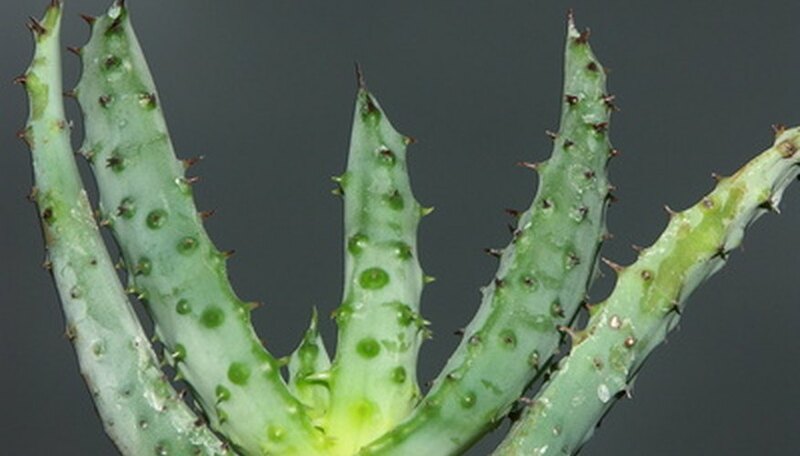 Aloe vera, like most succulents, is a low-maintenance plant. It has few requirements: water, sun and well-drained soil. And because it has so few needs, and is largely disease and pest resistant, it is easy to pinpoint the source of any problems that it may have. If your aloe vera pant has turned yellow, it is telling you that it is being watered improperly. Treat the problem by following a strict watering schedule to avoid over- or under-watering your aloe vera. Once irrigated properly, the color will return to your aloe vera's leaves. Measure the water that you give your potted aloe vera. In general, it should be watered once every few weeks with two cups of water. But you should test the moisture level of the soil every week to gauge when to water. If the top few inches of the soil is moist, hold off on watering the plant for another week and then check again. If it is dry before your scheduled watering--which may happen if the aloe is set outside in high temperatures--do not wait to water it. Change your aloe vera’s pot. Aloe vera does best in a shallow pot, equipped with drainage holes and wide enough to accommodate the width of its roots. Water in shallow pots drains more readily, which is ideal for aloe plants. Check your potted aloe vera’s soil. Unlike most houseplants, aloe vera cannot survive in potting soil which retains too much water. Your aloe vera should be planted in a shallow pot with drainage holes filled with a 1-inch layer of small rocks, followed by a commercial succulent or cactus potting soil. This well-draining soil will keep your aloe vera’s roots from standing in water, which leads to yellowing and eventually root rot.